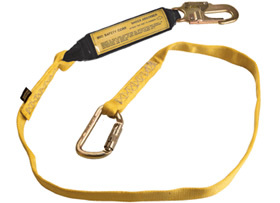 MIO Mechanical´s lanyards are specifically designed so that the webbing may be wrapped around an OSHA compliant structural support and the automatic locking carabiner can be "snapped" back onto the lanyard. Features include; captive locking carabiner for tie-back or direct connection to anchorage, and dual layer design. Soft-pack energy absorber with tie-back lanyard. 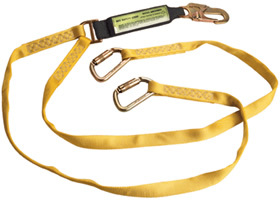 Soft-pack energy absorber with two (2) tie-back lanyards.